Lawmakers returned to Washington last week and House tax writers immediately began discussing a plan for another round of tax cuts, known as Tax Reform 2.0. You may recall, Republicans unveiled some elements of the proposal in July, including plans to make permanent a host of tax cuts for individuals due to expire in 2025. On Monday, House Ways and Means Republicans released three bills to address their main goals for Tax Reform 2.0: protecting middle class and small business tax cuts; promoting family savings; and growing brand-new entrepreneurs. The committee held a markup on the legislation Thursday morning, and all three bills advanced out of the committee on party lines. Democrats offered several amendments to the legislation, but all failed to be adopted. The House is expected to vote on the legislation the last week in September. Of note, the 2.0 bill would make permanent the increased AGI limits on cash gifts, which were raised from 50 percent to 60 percent in last year’s tax bill. It also appears to fix the “glitch” we identified after last year’s tax bill that caused the 60 percent cash limit to be reduced when non-cash gifts are claimed. So good news there. The Treasury Department and Internal Revenue Service released proposed regulations last month for the state and local tax (SALT) workarounds that states like New York, New Jersey and Connecticut have passed. The guidance states that donors must subtract from their federal charitable deduction the amount of state and local tax benefit they received for making their contributions. Among ACR’s biggest concerns is that the workarounds could not only undermine the charitable deduction by fostering a perception that it’s a tax loophole, but also blur the lines between government and charity. The regulations to curb the workarounds in high-tax states could also hit existing programs, such as those that provide tax credits for donations to scholarship granting organizations or conservation easements. ACR issued a press release on the proposed regulations on August 24. As you may recall, a provision in the Tax Cuts and Jobs Act would require that exempt organizations separately report their unrelated business activities and pay tax only on the activities that generate income. In short, tax-exempt organizations can no longer offset income from one line of activity with losses from another line of activity. There was a lot of confusion around where to draw the line to separate activities, so Treasury released preliminary guidance on UBTI calculation under the Tax Cuts and Jobs Act last month. Pending comments and issuance of final regulations, the notice provides that organizations can rely on a reasonable, good-faith interpretation when determining whether they have more than one trade or business, and suggests using the North American Industry Classification System (NAICS) codes to differentiate between trades. They’ve requested organizations submit comments on how to best determine different lines of unrelated business activity, which are due by December 3. Also included in the notice was a clarification that the new UBIT owed on transportation and parking benefits offered to employees can be netted against losses generally. To the extent your organization has other losses, including UBIT losses, you may be able to use those losses to zero out any tax associated with the new UBIT on transportation/parking benefits. There are several organizations in the sector working on this issue as well. As you may recall, in 2017 the Treasury Department released proposed regulations (and asked for comments) around donor-advised funds (DAFs) and how they’re used by taxpayers and private foundations. While Treasury staff spent the majority of this year crafting regulations for the newly implemented tax bill, we suspect they’ll be redirecting their attention back to these DAF regulations, and we want to get out in front of it. This week, ACR and other DAF stakeholders convened an ad hoc group to discuss the best strategy to collectively weigh in with Treasury. We’re hosting a meeting with Treasury staff next month to raise our collective comments and offer solutions. If your organization has specific concerns with this Treasury guidance, please let us know. On July 26, Rep. Erik Paulsen (R-MN) introduced The Everyday Philanthropist Act, which would allow employees to contribute up to $5,000, pre-tax, to a Flexible Giving Account (FGA) that would then be distributed to qualifying charities, should their employer offer the benefit. ACR is working with colleagues in the sector to provide Rep. Paulsen and his staff with input on the legislation and its potential impact on the sector. ACR is continuing to work with Council on Foundations, Independent Sector and other colleagues in the sector to coordinate in-district events with members of Congress to educate lawmakers and gain support for a universal charitable deduction. Most recently, ACR hosted in-district meetings with Rep. Tom Rice (R-SC) and Rep. Dan Kildee (D-MI), both of which were positive meetings. Rep. Rice acknowledged that taxpayers are incentivized by the charitable deduction to give more to charity, and Rep. Kildee said he supports expanding the charitable deduction to all Americans. We’ll continue to update you as we hold more of these meetings. Robert Sharpe, Chairman of the Sharpe Group and a member of ACR’s Advisory Council, is our guest author of Consider This this week. 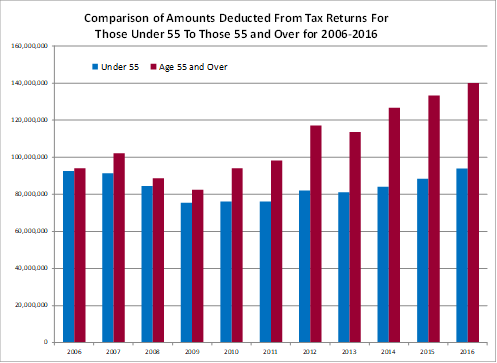 This trend further underscores the importance of restoring tax benefits for giving for the roughly 50 percent of prior itemizers who will no longer itemize under the TCJA and must make their gifts from after-tax dollars at significantly higher cost. For example, a non-itemizer who donates $1,000 to charity in a 24 percent tax bracket must earn $1,315 in pretax income to make this gift instead of $1,000 in income that would be required if the gift was deductible. Finally, there continues to be a disparity between the growth of cash gifts versus those of securities and other non-cash assets. Cash gifts were relatively unaffected by the Great Recession, while gifts of noncash assets have proven much more volatile over the past decade and accounted for the bulk of the decline in giving following the crash of 2008 as well as the lion’s share of the recovery in charitable giving as the country has emerged from the recession of the past decade. 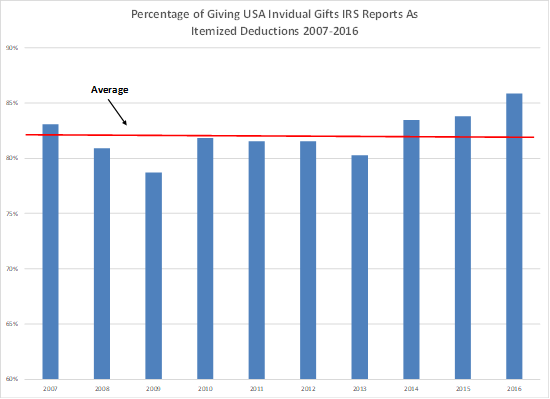 This latest data once again underscores the importance of exempting from taxation income that Americans are voluntarily devoting to charitable purposes. The most efficient and equitable way to do that is through the adoption of an above-the-line charitable deduction that allows all Americans to make at least a portion of their gifts from pre-tax income. Opinion – The Growth in Total Household Giving Is Camouflaging a Decline in Giving by Small and Medium Donors: What Can We Do about It?